Dana Schutz, Assembling an Octopus, 2013, oil on canvas, 10 x 13’. 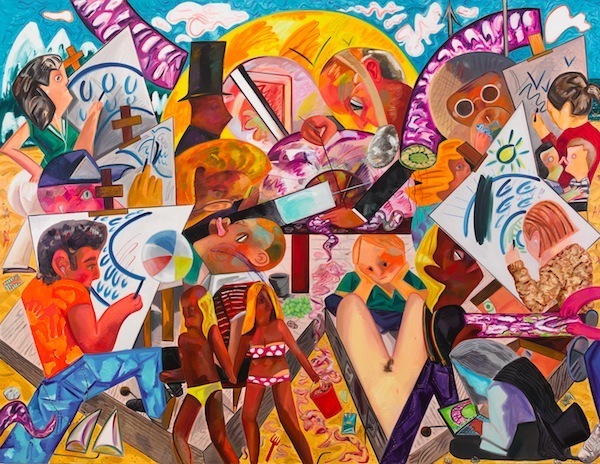 New York–based artist Dana Schutz is well known for her vivid paintings that freely associate fiction and realism. Her first solo exhibition in England is on view at the Hepworth Wakefield from October 12, 2013 to January 26, 2014. Schutz will also present new work at Contemporary Fine Arts, Berlin, from November 9 to December 7, 2013. Here, Schutz speaks about her recent canvases and the humor as well as “muscle memory” behind them. PAINTING HAS MANY ACTS that are put together as one. My exhibition at the Hepworth revolves around canvases that show figures demonstrating simple actions as vehicles for painting. There’s one painting, for instance, where a woman is getting dressed all at once—a very difficult subject to paint. She makes eye contact with the viewer and the stopping point is her gaze. There is usually a frontal address in painting, but it doesn’t always have to be aggressively physical. My process is akin to a rehearsal, where muscle memory is involved. It can almost be like building a house, where the series of marks are laid one on top of the other; if one mark doesn’t sit right, I’ll rebuild the whole thing from the bottom up. Or the process can feel like dancing, where there is a rhythm—a physical call and a response. For my latest painting in the show, Assembling an Octopus—which depicts a series of vignettes of people demonstrating actions—I worked on each part of the image wet on wet so that it looks as though the painting happened all at once. The work pictures a group of people that are individually engaged in scopic tasks but together assemble the image of an octopus. I wanted the whole painting to be open so I erased much of it and constantly repainted some sections until it was done, which also made the painting much thinner. An octopod’s skin acts like its brain; it uses it to communicate instead of telepathically hearing, wearing its thoughts on the outside. There are also elements within the painting that are octopus-like: There’s a woman inspecting a child’s tongue, for example. But there’s also a life drawing class and a couple walking on a beach, too. “Everyday” seems like what a politician would say, but my subjects are derived from this level of realism, rooting the work in some form of logic, whether it’s cause or effect, or just people having to wear clothes. Humor fits in there as well because there’s something recognizable about it. I generate this kind of information because I like the idea of being able to read a painting, instead of just registering an image that comes from life. My newest series that will be shown in Berlin depicts proposals for a god, or what God could look like without all the religiosity. I’m not particularly religious, but I was interested in God as a representational problem. When I was a kid, I thought God was a cross between Bob’s Big Boy—a restaurant chain I used to go to in Michigan where I’m from whose mascot is a chubby character with a pompadour—plus that really horrible Ray Charles–inspired big-head moon character from a 1980s McDonald’s commercial, and probably Liberace, all somehow mixed up in this pop-culture soup. But that’s really what I thought was up there in the sky—in orange, somehow without a perimeter. And maybe that’s the problem with trying to depict a thought: It doesn’t have an edge. I think of these works as portraits, but I also want to situate them in a desolate site, where there are buildings with windows peering into spaces with nothing in them. There might be black-and-white televisions, a Hawaiian shirt, and the Hollywood Hills. One of the gods’ pants could be from the 1940s and there could also be a noir aspect with intense shadows. God could be anything, so one could paint God as anything. Anyone could be a god, for that matter, because everyone has their own universe around them at their disposal. They can just Google it.